It wasn’t until we had our Jeep for several years that I realized not everyone rolls up their Jeep Wrangler rear window the same way we do. Ours is a 2004 Jeep Wrangler Unlimited. The Jeep is my daily driver, a.k.a. dog mobile. 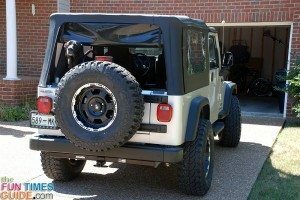 Here are some interesting things I’ve learned about the Jeep Wrangler rear window that could ultimately save you a little time… and money! I’m going to guess that we’re not the norm on this one. We always keep our Jeep Wrangler rear window rolled up (open) year round — even in the snowy winter months. We live in Nashville, Tennessee. Yes, we get all 4 seasons of weather here. And yes, it snows here. 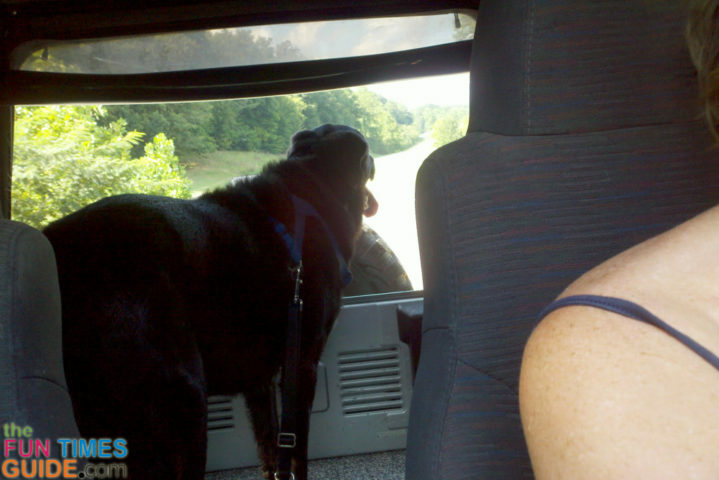 Regardless, our Jeep’s rear window almost always stays open! For one, the Jeep heater works really well. So even in the cold winter months with the rear window open, we never get cold. Second, we take our 100 lb. dog Jeeping with us a lot of the time. 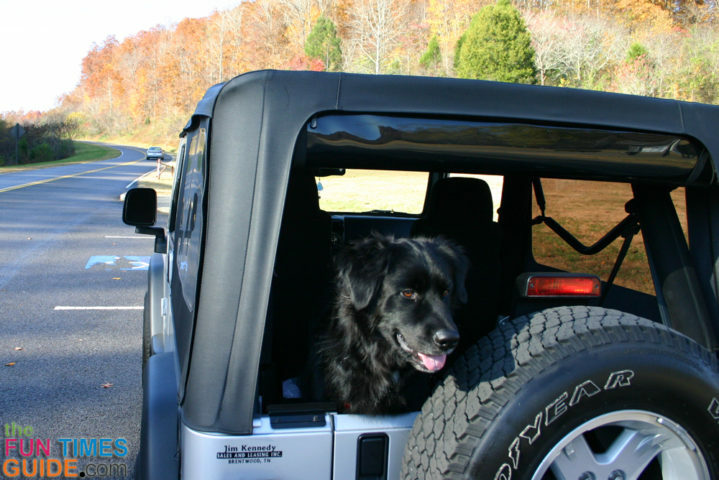 Having the Jeep Wrangler rear window rolled up all the time simply makes it easier to go somewhere with the dog spontaneously — without having to do anything special. We would have to be out & about in the Jeep and get caught in a major storm in order for us to zip the rear window closed. For the record, we keep the vinyl side windows in place most of the time, and only remove them (along with the rest of the soft top) a few times each year when we want the full effect of summertime fun. Our Sunrider top is routinely opened and closed throughout the warmer months. Whatever you do, just don’t try to scrape ice or snow off your Jeep’s vinyl windows in the cold winter months! Okay, that’s how we roll… but what about you? Do you leave the Jeep rear window rolled up all the time or no? You know that long bar that secures the bottom of the Jeep rear window to the tailgate and has a bit of rubber weather stripping to keep water out? It’s called a tailgate bar. We’ve always rolled the tailgate bar up with the vinyl window itself, and then secured it all in place using the attached Jeep window straps. 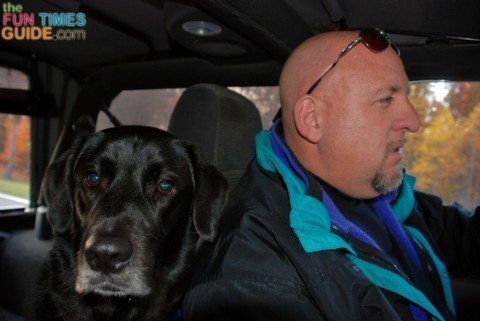 That way, it’s a cinch to unroll the window and close off the back of the Jeep it if it starts to rain, sleet, or snow. However, I recently learned that some Jeep owners actually remove the tailgate bar and just roll up the window by itself. I’m not 100% sure why. The downside: not having the bar handy if/when you need to close the rear window in a rain storm (unless you always tote it around with you). Plus the window tends to sag a bit in the center when it’s rolled up. The upside: you won’t stretch out the elastic rear window straps as quickly — because that bar adds a good deal of weight to what you’re rolling up. Technically, this is the proper way to roll up the Jeep Wrangler rear window. How about you? 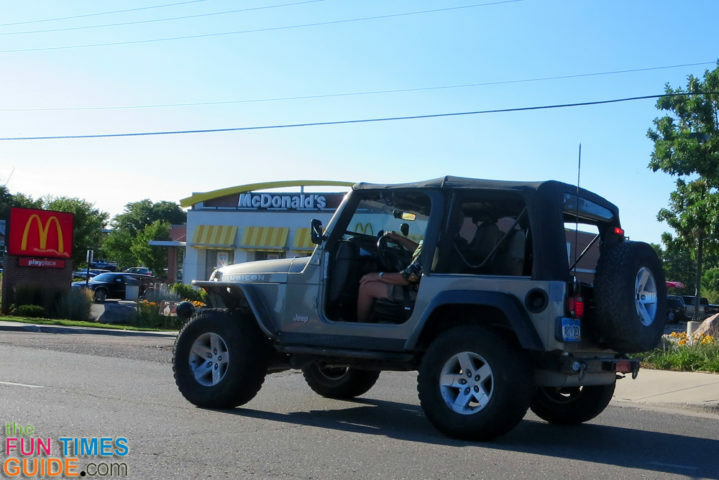 Do you roll up the Jeep window with the tailgate bar inside, or not? At this point, with a 10-year-old Jeep Wrangler, I’d love to have some new rear window straps. That said, we are still using the original Jeep rear window straps and they do the job fine — they’re just a little stretched out. To make them seem “almost new,” I simply double-wrap each elastic strap around the rolled up window now. That way, there’s no sagging, bouncing, or obstruction of the rear view. Have you found another unique way to keep the Jeep Wrangler rear window rolled up and out of sight? I’ve heard from a number of Jeep owners who’ve had problems fixing stuck or broken Jeep window zippers. If the teeth of the zipper are not torn (the black fabric part with plastic coil)and the silver tabs you start the zipper with are still attached you can replace the zipper sliders (the sliver pull things that mesh the teeth) and fix your window. Any upholstery, boat, or awning shop should be able to do this for you while you wait for less than $40. Takes about 10 min tops. The sliders you need are #8 coil, (not vislon) non-locking, double separating. You’ll need the top and bottom slider set. Ask if they can upgrade you to the stainless steel marine grade sliders used on boats. Tell them what it’s for and they can help get you the parts you need. They only cost a couple bucks. If you can’t find a local shop to install them call or email Seattle fabrics or Tandy leather supply for a slider set and stops. Just takes some needle nose pliers and few minutes to install. We use Dawn dishwashing detergent and a soft brush to give the zippers a deep cleaning every couple of years. We use Jeep-friendly vinyl cleaners for routine cleaning year-round. 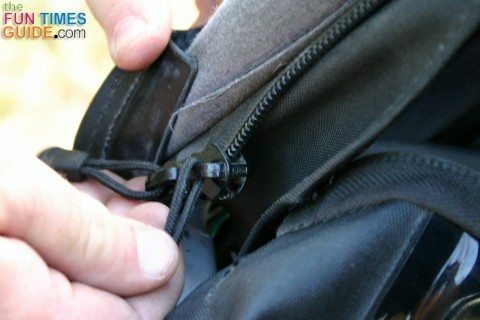 Our Jeep zippers are still in good condition, after 10 years! 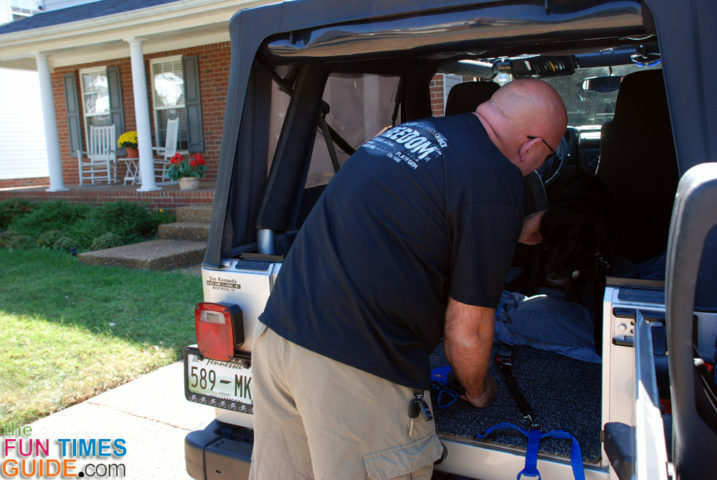 Here are a few more tips for caring for your Jeep zippers and some helpful advice before rolling up a Jeep rear window. I’ve mentioned before that we use the Clover Patch window tote. It holds both of the vinyl side windows and/or the rear window — all rolled up like a long tube — in a durable tote bag. We absolutely love it. It’s super handy and keeps the side windows and rear window from getting scratched, bent, or damaged. 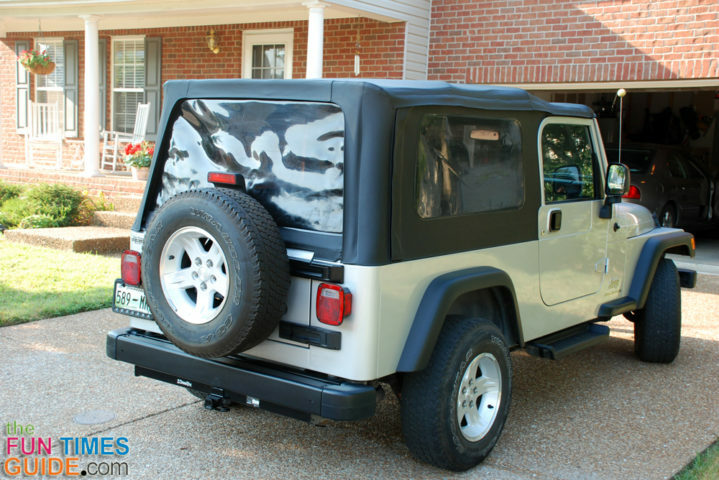 You can use it for permanent (summer) storage of your Jeep’s vinyl windows. Just keep it in the garage until you decide to put the Jeep windows back in during the winter months. 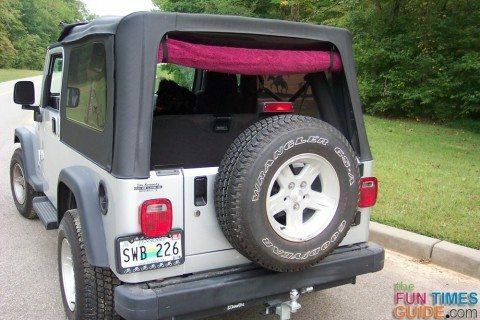 You can toss it in the back of your Jeep and use it as a portable tote bag for your Jeep’s windows. That way, your Jeep windows are always within reach should bad weather arise. This is a great option for long trips, away from home. Here’s how to make your own Jeep window storage tote. They say any time you’ve got plastic on plastic (or vinyl on vinyl), you’ll get scratches — even if the surface is perfectly clean. It’s true. 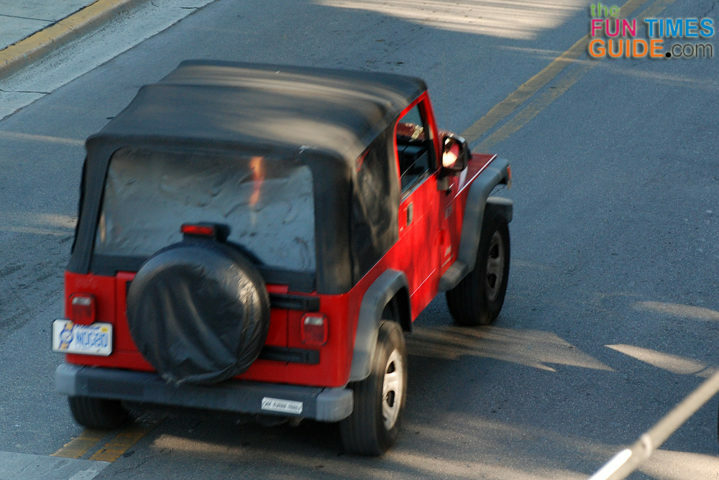 Rolling up the rear window and driving with it rolled up quickly led to scratches on our Jeep Wrangler rear window — even though we went to great lengths to “baby” our new Jeep in the first months that we owned it. When we started to notice the scratches appearing, we decided to place a towel on the vinyl window before rolling it up into itself and securing with the Jeep window straps. (It would have definitely looked better with a black towel!) This did prevent scratches, but wasn’t worth the effort each time, in our opinion. In the end, we decided our Jeep wasn’t going to be babied like fine china. Our Jeep was going to be lived in and enjoyed to the fullest — scratches and all. Yes, over time the rear window became slightly cloudy and it’s difficult to see out of when it’s zipped closed. But hey, it is a Jeep! And I’m not sure how well we could see out of the rear vinyl window when it was brand new anyway. Use car wax to remove scratches on vinyl Jeep windows. Lots of automotive cleaners are made for the purpose of removing scratches from vinyl. So what about you?… Do you go to extra lengths to protect the rear window from scratches? How do you store (or tote) the vinyl windows from your Jeep soft top? Well, those are my own 5 Jeep Wrangler rear window tips. 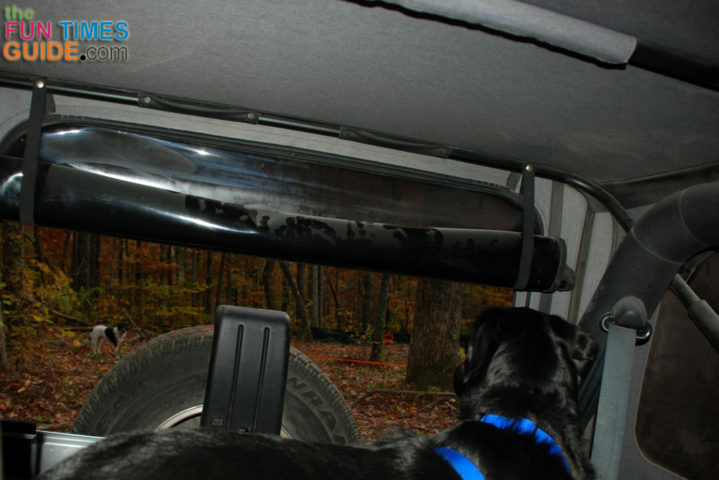 What other Jeep window tips do you have for new Jeep owners?